The Latin for Children: Primer A Student Text & Workbookis easy to use, incremental, and filled with clear grammatical explanations written expressly for the student. Lessons teach mnemonic aids (songs, chants) that enable students to learn vocabulary and grammar with ease and delight. There are clear explanations of grammar in every chapter, written at the student's level, along with exercises, quizzes, and a useful reference section. Guidance is given for both classical and/or ecclesiastical pronunciations. Chapters begin with a maxim, a new chant, and vocabulary words; this introduction is followed by a chapter story with Latin words integrated into the text. A grammar lesson follows with worksheets (on both the Latin lesson and English derivatives) and a quiz. Reviews are incorporated throughout, and an end-of-book review is also included. 274 full-color pages with glossary, softcover. Consumable and non-reproducible. The recommended schedule is designed to take 30 minutes per day, five days per week. Covers one year. Grades 4-7. Classical Academic Press' award-winning Latin for Children curriculum is a strong, inviting, and creative program designed to introduce students (4th Grade & up) to Latin. It incorporates elements that will engage students of every learning style. When used as a whole, this series trains students in grammar, vocabulary, and English derivatives in a lively, interactive way that is perfectly suited to students in the grammar stage. The Latin for Children series is taught directly to the child and is a perfect choice for teachers and parents, including those who will be learning along with their students. The textbook has been enhanced with beautiful illustrations as well as images and paintings of ancient Roman culture. An adventure story, Along the Appian Way, has also been added. The chapter-by-chapter Latin grammar sequence remains the same as previous versions. The new teaching video is now in high-definition. The old editions of the primer and answer keys are not compatible with this newly revised edition. The DVD will work with previous editions of the text. The Activity Book and History Reader are still compatible with either version. 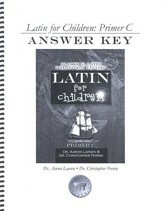 This answer key is designed to be used alongside the Latin for Children Primer A Text, Revised Edition (sold-separately and not-included). This key features full-size reproductions of the student pages in the primer with the correct answers overlaid in bold print. It also includes a suggested weekly schedule. 243 pages, softcover. Revised edition. 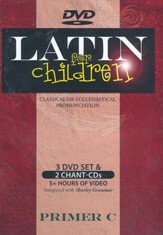 The Latin for Children: Primer A DVD & Chant CD Set, Revised Edition (now in high definition!) offers chapter-by-chapter teaching by author Dr. Christopher Perrin. 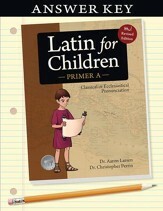 Each lesson is 20-25 minutes and corresponds to the weekly chapter in Latin for Children Primer A. It features the chanting and singing of vocabulary, including noun declensions and verb conjugations, and clear grammatical explanations. The video can be used to prep the teacher for the lesson, to help a student catch up on a missed lesson, to help a student maintain or catch up over the summer, or as a substitute when the teacher is absent. The audio files (or CDs) capture the teacher and students pronouncing and rhythmically repeating each grammar chart and vocabulary word in the primer-first the Latin, then the English equivalent. These chants are an incredible tool to use for fun memorization and contain all 240 vocabulary words chanted and sung in both the classical and ecclesiastical pronunciations. This activity book accompanies Classical Academic Press' sold-separately Latin for Children Primer A Text, New Revised Edition. Over 100 pages of games, puzzles, art ideas, crossword puzzles, and other fun activities will help students really cement their Latin vocabulary and grammar. 163 pages, softcover, answers included. 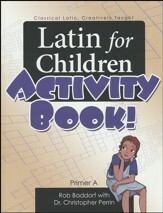 This Activity Book can still be used with the New, Revised Edition of the Latin for Children Primer A curriculum. 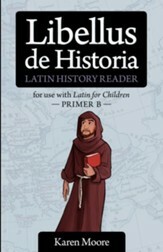 This Latin History Reader is designed for use alongside Latin for Children, Primer A -- New, Revised Edition. Fifteen stories about ancient Greek and Roman history are included; vocabulary and grammar is integrated with the Primer A. Chapters include numbered sentences, a glossary, and response questions. Answer key available online. 56 pages, softcover. 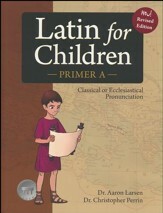 This resource is still compatible and designed to be used with the new, revised edition of Latin for Children Primer A. Test your knowledge of Latin as you play a challenging game of vocabulary memorization. 240 vocabulary words with 3 levels of play and a customizable deck are provided--you can play either "day" or "night" words (the word on the light or dark end of the card), and you can practice English to Latin or Latin to English. Play Quick Clash (similar to War) or Great Clash, and you can even play with people using different-language Clash Cards! 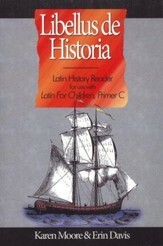 This set includes high frequency Level 1 Latin vocabulary cards. Latin for Children B is easy to use, incremental, and filled with clear grammatical explanations written to the student. Lessons teach mnemonic aids (songs, chants) that enable students to learn vocabulary and grammar with ease and delight. Guidance is given for both classical and/or ecclesiastical pronunciations. In Primer B, students will learn new grammatical concepts (such as third declension nouns, demonstrative pronouns, and third-conjugation verbs), Latin numbers, and 240 new high-frequency vocabulary words. Chapters include a memory page with new chant, new vocabulary, and vocabulary review, a story where students have to translate certain phrases and words, grammar activities, translation exercises, and a quiz. Reviews are incorporated throughout, and an end-of-book review is also included. 324 full-color pages with glossary, softcover. Consumable and non-reproducible. The recommended schedule is designed to take 30 minutes per day, five days per week. 32 chapters. Covers one year. Grades 5-7. This new, revised edition is now printed in full color and has been enhanced with beautiful illustrations as well as images and paintings from medieval European culture. A medieval adventure story, Seeking Donum, has also been added. Students will continue to follow Marcus and Julia-this time as they try to escape from a sinking ship and make their way back home to safety through an unknown land full of dangers and surprises. The chapter-by-chapter Latin grammar sequence remains the same as previous versions. There is also a new teaching video DVD to accompany the course (sold-separately). Please Note: The old editions of the primer and answer key are not compatible with this newly revised edition (though the grammar is taught in the same sequence). The DVD (sold-separately), however, will still work with previous editions of the text. The Activity Book and History Reader (both also sold-separately) are also still compatible with either version. This answer key is designed to be used with the Classical Academic Press Latin for Children Primer B Text, Revised. Full-size student pages are reproduced with the correct answers overlaid. 276 pages, softcover. 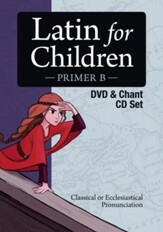 The Latin for Children: Primer B DVD & Chant CD Set, Revised Edition (now in high definition!) offers chapter-by-chapter teaching by author Dr. Christopher Perrin. 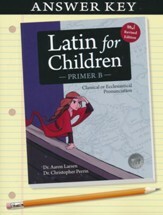 Each lesson is 20-25 minutes and corresponds to the weekly chapter in Latin for Children Primer B, 2nd Edition. It features the chanting and singing of vocabulary, including noun declensions and verb conjugations, and clear grammatical explanations. The video can be used to prep the teacher for the lesson, to help a student catch up on a missed lesson, to help a student maintain skills or catch up over the summer, or as a substitute when the teacher is absent. The audio CDs feature the teacher and students pronouncing and rhythmically repeating each grammar chart and vocabulary word in the primer-first the Latin, then the English equivalent. These chants are an incredible tool to use for fun memorization and contain all 240 vocabulary words chanted and sung in both the classical and ecclesiastical pronunciations. Please Note: This DVD is a new release designed to work with the new revised edition of Latin for Children Primer B. However, the old DVD will still work with previous editions of the text. The Activity Book and History Reader (both also sold-separately) are also still compatible with either version. The new primer and old answer key are not compatible with each other. 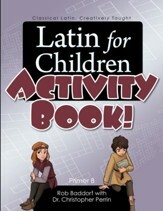 This workbook accompanies the Latin for Children Primer B Text, and follows the text chapter-for-chapter. With a variety of games to pick from, parents and students can choose to do all of them, or pick and choose puzzles that provide the most reasonable sense of a challenge. Have fun reinforcing Latin Lessons with crosswords, word searches, codes, mazes, matching, mad libs, and other illustrated and themed activities that go far beyond most workbook "games". There's also a "Whopper Crossword Puzzle" that involves every single vocabulary word used in the textbook-and this puzzle is so big you'll probably want to assemble it first, as it measures 37.5" x 30"! The game Retro-Specto has all the word cards included, as well as directions for each of the four games you can play. Answer key included. 94+ pages, softcover. 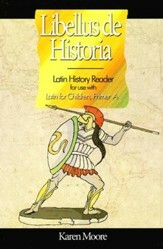 This Latin Children's reader is integrated with the grammar and vocabulary of Latin for Children Primer B Text, though it may be used as a supplement for other Latin curricula as well. Short Latin selections, often accompanied by small pen-and-ink illustrations, are followed up with a glossary, notes, and comprehension questions. A full glossary is included at the back of the book; answers are available online at the publisher's website. 154 pages, softcover. Test your knowledge of Latin as you play a challenging game of vocabulary memorization. 256 vocabulary words with 3 levels of play and a customizable deck are provided--you can play either "day" or "night" words (the word on the light or dark end of the card), and you can practice English to Latin or Latin to English. Play Quick Clash (similar to War) or Great Clash, and you can even play with people using different-language Clash Cards! This set includes high frequency Primer B, Level 2 Latin vocabulary cards. This game is keyed to the sold-separately Latin for Children, Primer B Text from Classical Academic Press. 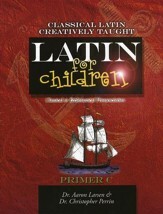 The Latin for Children: Primer C Student Text & Workbook is the third and final level in the Classical Academic Press "Latin for Children Primer" series. Building upon the previous levels, the previous levels should be completed before beginning Level C. Like the previous levels, lessons teach through mnemonic aids (songs, chants) that enable students to learn vocabulary and grammar with ease and delight. There are clear explanations of grammar in every chapter, written at the student's level, along with exercises, quizzes, and a useful reference section. Guidance is given for both classical and/or ecclesiastical pronunciations. Chapters include new chants, new vocabulary words, a review of vocabulary words, grammar instruction & practice, memory-work, translation exercises, an activity, and a chapter quiz. A reference chart and a suggested schedule outline is provided at the back of the book. By the end of the course students will have learned over 240 high-frequency Latin words. 310 pages with glossary, softcover. Consumable and non-reproducible. The recommended schedule is designed to take 20-30 minutes per day, five days per week. 32 chapters; covers one year. Grades 6-7. Answer Key features the actual text with answers in bold print. Spiral, 253 pages. Learn Latin along with two home-schooled girls as they are taught by author Christopher Perrin at home. Each lesson features the chanting and singing of vocabulary and paradigms along with clear grammatical explanations by Dr. Perrin. the actual text from the book appears on the screen as the girls chant and sing their vocabulary and paradigms, making it easy to follow along. This set features 3 DVDs with 5+ hours of video, and 2 chant CDs. 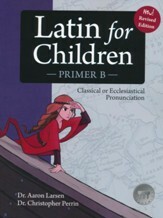 This Latin Children's reader is integrated with the grammar and vocabulary of Latin for Children Primer C Text, though it may be used as a supplement for other Latin curricula as well. Short Latin selections, often accompanied by small pen-and-ink illustrations, are followed up with a glossary, notes, and comprehension questions. A full glossary is included at the back of the book; answers are available online at the publisher's website. 188 pages, softcover. 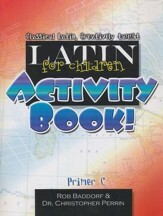 This workbook accompanies the Latin for Children Primer C Text, This workbook accompanies the Latin for Children Primer B Text, and follows the text chapter-for-chapter. With a variety of games to pick from, parents and students can choose to do all of them, or pick and choose puzzles that provide the most reasonable sense of a challenge. Have fun reinforcing Latin Lessons with crosswords, word searches, codes, mazes, matching, mad libs, and other illustrated and themed activities that go far beyond most workbook "games". There's also a "Fossa Vasta: The Big Dig Game" that involves every single vocabulary word used in the textbook, and plays similarly to "Battleship." Answer key included. 136 pages, softcover. Worksheets are not reproducible, only the game elements which need to be cut out to play.